GODDARD, 1857. Britton & Rey’s map of the State of California, compiled from the U. S. land & coast surveys, the several military, scientific & railroad explorations, the state & county, boundary surveys made under order of the Surveyor General of California, & from private surveys. By George H. Goddard, C. E. Completed with additions & corrections up to the day of publication from the U. S. Land Office & other reliable sources. Lithy. of Britton & Rey, Montgomery St. cor. Commercial, S. F. Entered 1857. *Spelled GARDNER on map; correct spelling appears to be GARDINER. 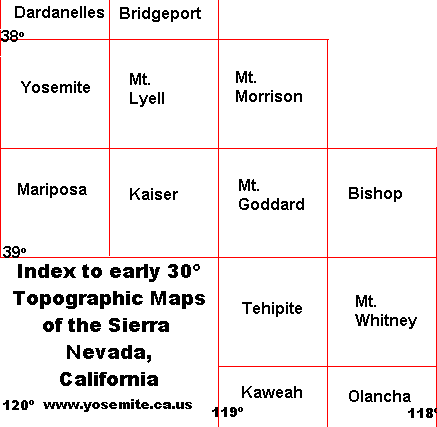 WHEELER SURVEY: CENTRAL SIERRA NEVADA, 1878-1879. Parts of Central California, atlas sheet 56D. Geographical Surveys West of the 100th Meridian: Capt. Geo. M. Wheeler, Corps of Engineers, U. S. Army. Expeditions of 1878, ‘79, under the command of 1st Lieut. M. M. Macomb, 4th Artillery, U. S. Army; J. C. Spiller, F. O. Maxson, topographical assistants. Scale, 1:253440. MUIR, 1891. Map of the Sequoia National Park and Proposed Addition; Map of the Kings River Yosemite. (Two small sketch-maps in Century Magazine, November, 1891, pp. 78, 79. SKETCH MAPS IN SIERRA CLUB BULLETIN. Kings-Kern, by J. N. Le Conte, in I:1, 1893; Kings River Region, by B. C. Brown, in I:8, 1896; Kings-Kern, by B. C. Brown, in II:1, 1897; Bubbs Creek, by J. N. Le Conte, in II:2, 1897; Kaweah Peaks, by W. R. Dudley, in II:3, 1898; Bubbs Creek, by C. B. Bradley, in II:5, 1899; Triangulation between Mount Ritter and Mount Whitney, by J. N. Le Conte, in II:5, 1899; Ouzel Basin, by D. S. Jordan, in III:1, 1900; Sixty Lake Basin, by B. C. Brown, in III:2, 1900; Fish Creek, by Lincoln Hutchinson, in IV:3, 1903; Palisades, by J. N. Le Conte, in V:1, 1904; South Fork of San Joaquin, by J. N. Le Conte, in V:3, 1905; High Mountain Route, by J. N. Le Conte, in VII:1, 1909; Tuolumne Soda Springs, by J. N. Le Conte, in IX:1, 1913; Tenaya Cañon, by J. N. Le Conte, in IX:3, 1914; Colby Pass and Black Kaweah, by J. S. Hutchinson, in XI:2, 1921; Kings River Region, by J. S. Hutchinson, in XI:4, 1923; Mount Goddard and Simpson Meadow, by J. S. Hutchinson, in XII:1, 1924; Tehipite Valley, by T. S. Solomons (1897), in XII:2, 1925; Kings River Cañon and Yosemite Valley, by F. E. Matthes, in XII:3, 1926. U.S.G.S. : YOSEMITE QUADRANGLE. Surveyed, 1893-1894; topography by R. B. Marshall; triangulation by H. E. C. Feusier; edition of 1909, reprinted 1923. U.S.G.S. : DARDANELLES QUADRANGLE. Surveyed, 1891-1896; topography by R. H. McKee, R. B. Marshall; triangulation by H. E. C. Feusier; edition of 1898, reprinted 1912. U.S.G.S. : MT. LYELL QUADRANGLE. Surveyed, 1898-1899; topography by R. B. Marshall; triangulation by H. E. C. Feusier; edition of 1901, reprinted 1922. U.S.G.S. : KAISER QUADRANGLE. Surveyed, 1901-1902; topography by R. B. Marshall; triangulation by E. T. Perkins; edition of 1904, reprinted 1923. U.S.G.S. : KAWEAH QUADRANGLE, Surveyed, 1902; topography by E. C. Barnard, A. 1. Oliver, R. B. Oliver, W. C. Guerin; triangulation by E. T. Perkins; edition of 1909, reprinted 1921. U.S.G.S. : TEHIPITE QUADRANGLE. Surveyed, 1903; topography by R. B. Marshall, George R. Davis; triangulation by E. T. Perkins; edition of 1905, reprinted 1924. U.S.G.S. : MT. WHITNEY QUADRANGLE. Surveyed, 1905; topography by G. R. Davis, C. L. Nelson, S. N. Stoner; triangulation by C. F. Urquhart; edition of 1907, reprinted 1921. U.S.G.S. : OLANCHA QUADRANGLE. Surveyed, 1905; topograplly by S. N. Stoner, J. P. Harrison; triangulation of C. F. Urquhart; edition of 1907, reprinted 1922. U.S.G.S. : BRIDGEPORT QUADRANGLE. Surveyed, 1905-1909; topography by A. H. Sylvester, George R. Davis, Pearson Chapman; control by A. H. Sylvester, C. M. Weston, C. R. Smith; edition of 1911, reprinted 1920. U.S.G.S. : MT. GODDARD QUADRANGLE. Surveyed, 1907-1909; topography by George R. Davis; control by C. F. Urquhart, L. F. Biggs; edition of 1912, reprinted 1923. U.S.G.S. : MARIPOSA QUADRANGLE. Surveyed, 1909-1910; topography by C. H. Birdseye, A. J. Ogle, T. P. Pendleton, E. R. Bartlett, J. W. Muller; control by C. F. Urquhart, L. F. Biggs, L. D. Ryus; edition of 1912, reprinted 1920. U.S.G.S. : BISHOP QUADRANGLE. Surveyed, 1910-1911; topography by George R. Davis, B. A. Jenkins; control by C. F. Urquhart, L. F. Biggs, R. A. Farmer; edition of 1913, reprinted 1920. U.S.G.S. : MT. MORRISON QUADRANGLE. Surveyed, 1911-1912; topography by B. A. Jenkins, J. G. Staak, S. E. Taylor, C. W. Wardel; control by C. F. Urquhart, L. F. Biggs, C. W. Wardel; edition of 1914. U.S.G.S. : YOSEMITE VALLEY. 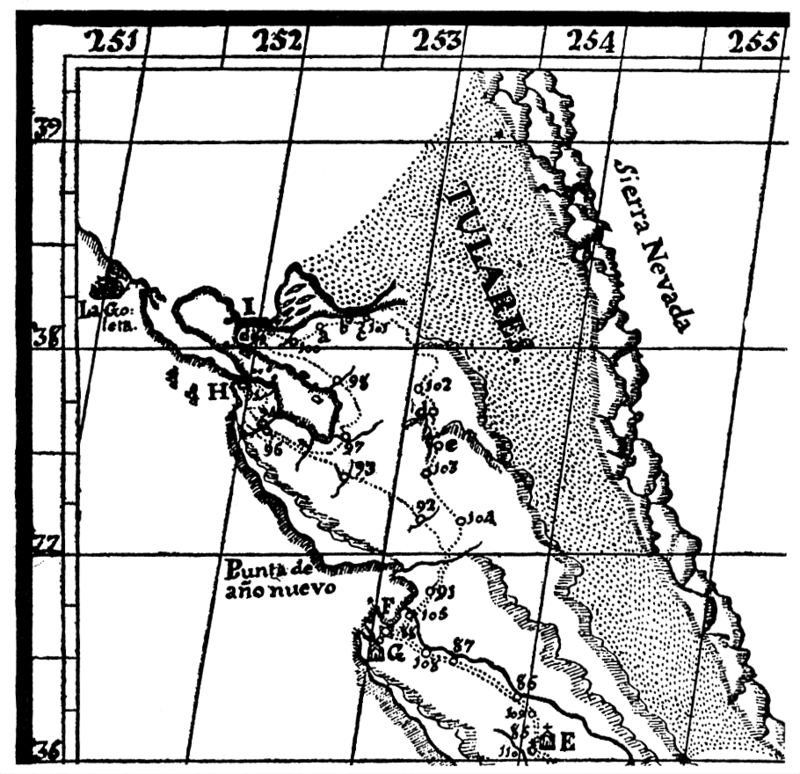 Surveyed, 1905-1906, in co-operation with the State of California; scale, 1:24,000; contour interval, 50 feet; topography by F. E. Matthes; triangulation by C. F. Urquhart; edition of 1907, reprinted 1922.